A Dictionary of Occupational Terms Based on the Classification of Occupations used in the Census of Population [for Great Britain], 1921. Originally published as a printed book, the Dictionary of Occupational Terms is by far the most comprehensive dictionary of British occupations, with almost 30,000 terms, and includes (sometimes very detailed) descriptions of the activities that each occupation involves. A Dictionary of Occupational Terms Based on the Classification of Occupations used in the Census of Population, 1921 is extremely rare. In the British Isles, copies are available in only three of the six legal deposit libraries, four university libraries, two public libraries, and the London Library. The UK National Archives has two copies, one in the document collection and one on the shelves in the Research & Enquiries Room. Copies occasionally surface in the second-hand book trade. The Boyle County (KY) Genealogical and Historical Society, Inc, now offers for sale a CD of Bill and Beulah Jones’s massive work on Danville’s Bellevue Cemetery Records. The new CD contains more than 14,000 documented and well-researched entries, adding to and correcting the city’s records. Though Bellevue is not the oldest cemetery in the county, many earlier interments have been moved to the Bellevue Cemetery, so Bellevue has become THE resting place of many important historical figures in the central Kentucky area, from the early 19th Century on. Bill and Beulah have spent several years working on this project. The CD contains a Microsoft Excel file of the records (printable on 8-1/2 by 14 paper), an Adobe PDF version, an explanatory page, and a series of overall and detailed maps of Bellevue. If you’ve tried listening to any of your old music CDs lately—if you even own them anymore—you may have noticed they often won’t play. The same is probably true of data stored on CD-ROM disks; the older ones are deteriorating and are becoming more and more difficult to use. The data CD-ROM disks are producing more read errors than they used to. Luckily, there are easy solutions available if you take steps NOW. Finally! Someone has found a use for all those AOL disks that were sent to your house and given away by many stores. Jason Scott Sadofsky is a Free-Range Archivist & Software Curator for the Internet Archive. 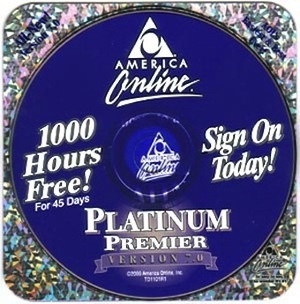 He wants every disc ever made, but is specifically requesting that readers of his blog send him old AOL discs, the kind that came free at Best Buy checkouts, packed in magazines and mailed randomly to your house back in the 1990s. He wants to add them to an online archive of computer history.